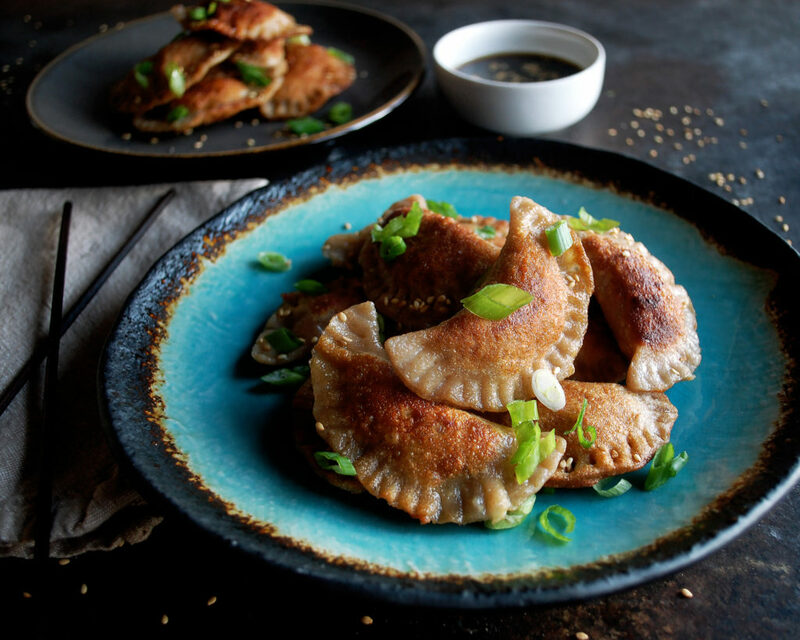 Pot stickers: soft dumplings filled with a traditionally flavored chicken & cabbage mixture…then fried until crisp. 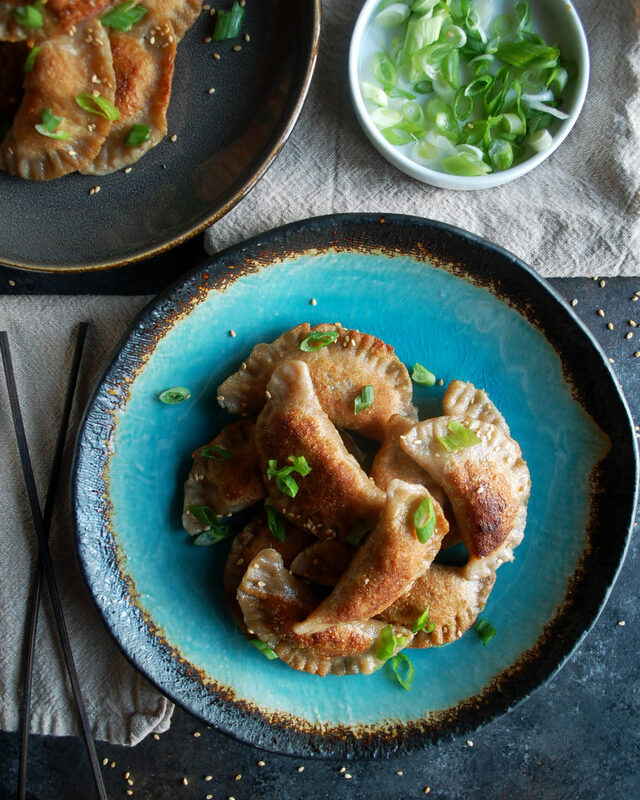 Pot stickers are known as “guotie” in Chinese which means “wok stick”. Whether they’re fried in a pot or a wok, they’re absolutely delicious. Pot stickers is the one dish I always love to get at Chinese restaurants because I’ve never had a bad one. And I’ve actually had some absolutely amazing ones. The history of this dish has somewhat been lost over time, but there is a myth out there. It’s said that a chef was boiling dumplings like usual and he let them boil too long. All the water evaporated and the dumplings had “stuck” to the bottom of the wok. He pried them out and served them, and I guess the dish stuck, too. 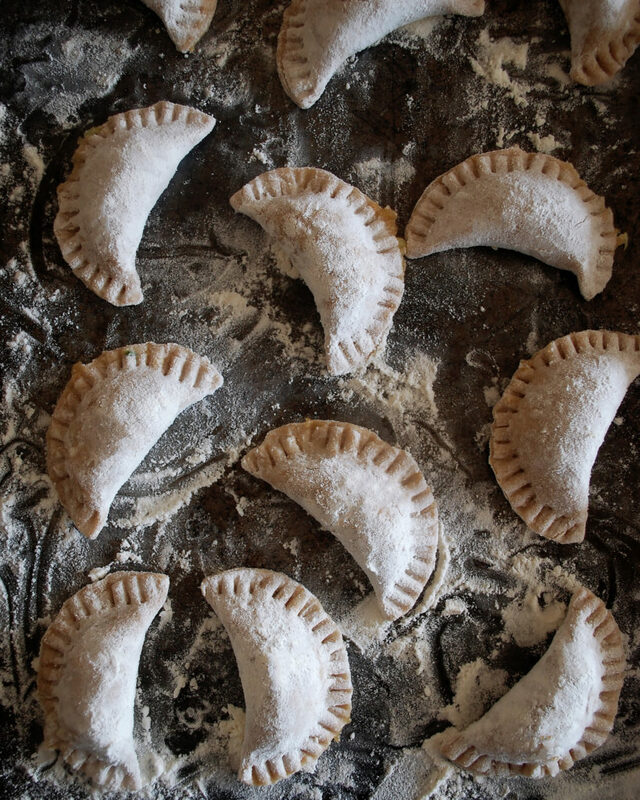 Years and years later you see them everywhere, typically filled with a pork filling. 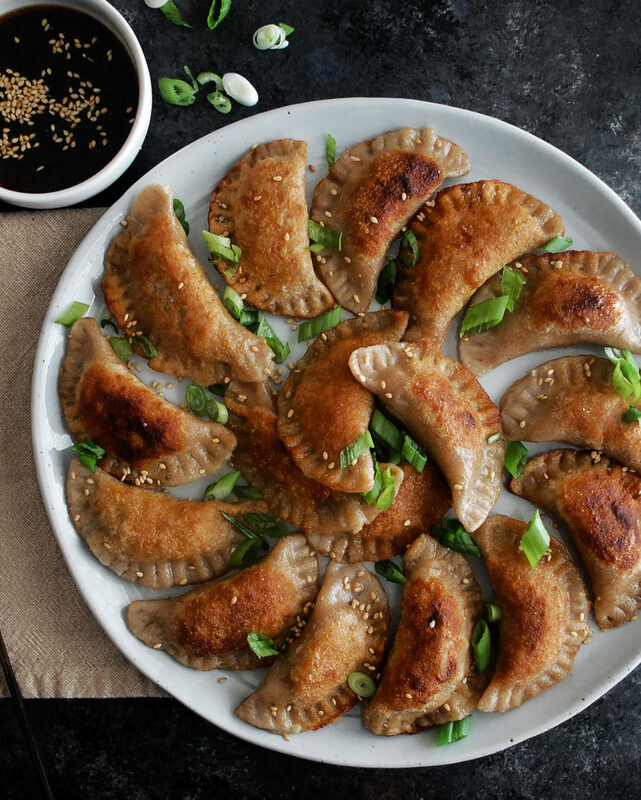 I was taught to make pot stickers just like that, where you start them in a pan with liquid and let the liquid cook out until the bottoms crisp up. The method I prefer, though, is just a little different. You boil the dumplings for a few minutes first, let them dry a bit, and then fry them in a pan with sizzling hot oil. A Lodge cast-iron pan works well for a really nice pan-fry finish. This way seemed to work a little better for me and formed a wonderful crispy texture. I fried mine on both sides, but you can also just fry the bottoms and keep the topside soft. It’s a fun project to work on, and forming the dumplings can be quite relaxing (well, I find working with any dough relaxing, but that’s just me). 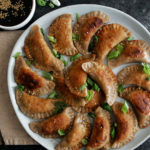 Anyways, the pot stickers are filled with a simple chicken filling, which you can substitute with ground pork if you like that flavor better. I had ground chicken on hand so just tossed that into a bowl with thinly sliced cabbage, some traditional Asian flavors, and called it a day. While the pot stickers were frying, I realized I probably should have a dipping sauce to dunk these in. Soy sauce, fish sauce, a little rice wine, and lots of orange juice and zest, plus some sesame oil and honey, made a perfect sauce. I added lots of toasted sesame seeds to the sauce, and sprinkled more over the finished pot stickers, as well as some sliced scallions. I’d say they turned out to be a pretty fun appetizer to make, and the flavors were spot on! Enjoy! Combine both flours in a food processor. Run the machine as you slowly add the boiling water. Blend until a dough begins to form, about 20 more seconds. Turn the dough out onto a floured work surface knead for about 4-5 minutes until the dough is soft. Cover with plastic wrap and let rest on the counter for 1 hour. Combine the ground chicken, cabbage, scallions, ginger, soy sauce, and sesame oil in a large mixing bowl. Mix well. Beat the egg separately and incorporate into the mixture. Sprinkle the cornstarch and salt in and mix. Refrigerate until ready to use. Unwrap the dough and turn out onto a floured work surface. Cut in half. Keep one half covered while you work with the other. Roll the dough out to a thickness of 1/16-inch. Use a 3 ½” circular cutter to cut circles. Cover the pieces to prevent them from drying out. Spoon a tablespoon of filling onto each circle of dough (make sure you don’t over-fill or else the dough won’t seal). Fold the circles in half and crimp the edges. 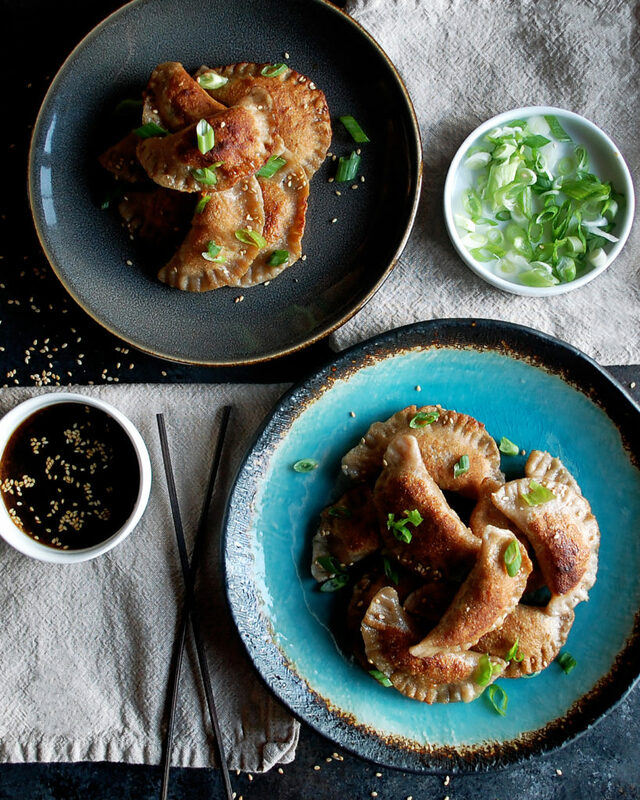 Keep the pot stickers covered and repeat with the other half of dough. Meanwhile, bring the chicken stock and water to a boil in a pot. When all the pot stickers are formed, begin to cook. Work in batches to boil the pot stickers for just about 3 minutes each in the liquid. Remove to a plate. Once all of them are dry, heat a large cast-iron skillet over medium heat. Add enough oil to cover the bottom. 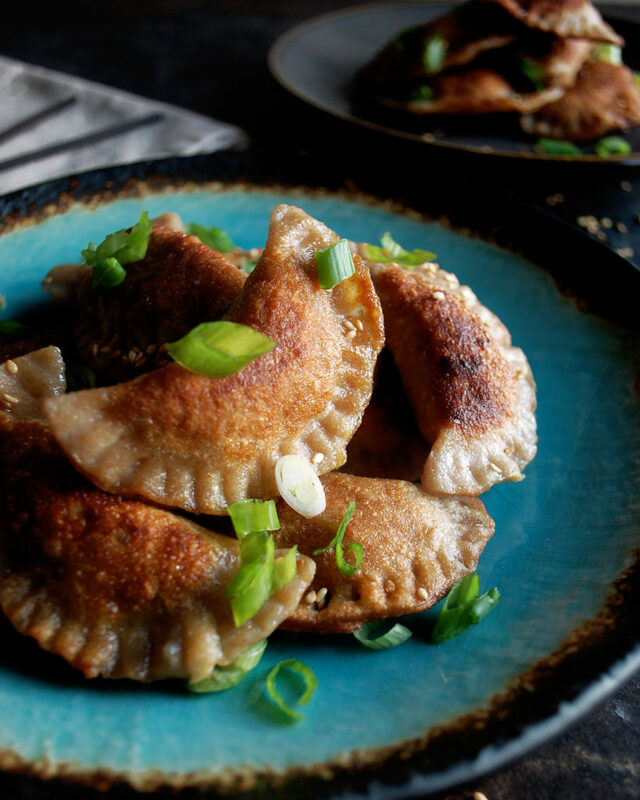 Pan fry the pot stickers until golden and crispy on one side. You can flip and crisp the other side, or leave that side soft. 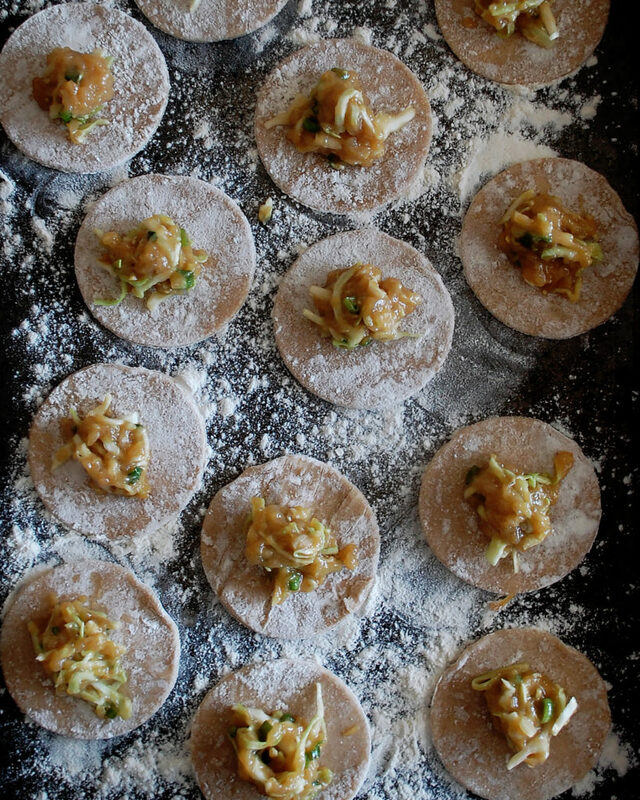 Transfer the pot stickers to a plate lined with paper towels. Serve warm. Meanwhile, whisk the soy sauce, fish sauce, fresh orange juice, orange zest, sesame oil, honey, and rice wine together in a small saucepan over medium heat. Bring to a boil. Drop the heat to medium-low and let simmer until slightly reduce, about 5 minutes. Transfer to a bowl to serve with sesame seeds to garnish. 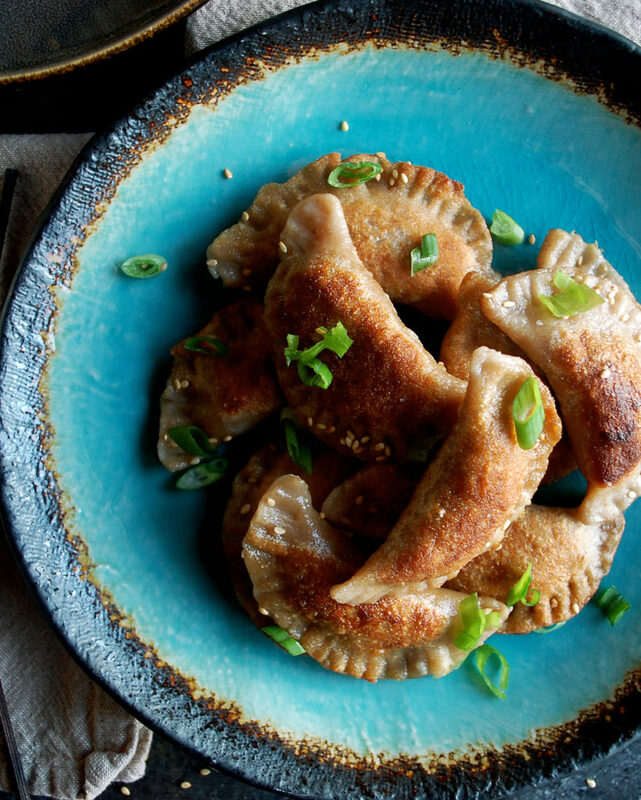 Serve the pot stickers warm with the orange sesame dipping sauce on the side. Sprinkle more toasted sesame seeds and scallions over the top of the pot stickers. You can substitute the ground chicken for ground pork if you’d like.